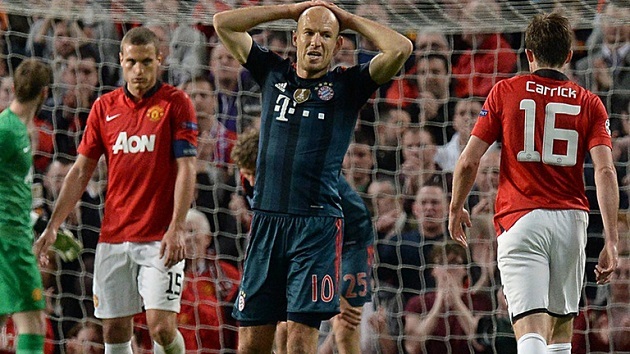 Just over a week ago, I spent a few hundred words to summarize my opinion on FC Bayern München’s chances of leaving Old Trafford with a favorable result in the first leg of their Champions League tie with Manchester United. Bayern coach Pep Guardiola? Five words, only four of which were unique. I am somewhat known for my tendency to use ten words when one will do. Considering Pep’s preference for doing the same with passing, I’m a bit surprised at his brevity. Perhaps I should just leave my take on Wednesday’s second leg similarly brief. Because some will read into this that I expect Bayern to score half-a-dozen and keep a clean sheet regardless of how I elaborate, I’m just going to throw caution to the wind and let it rip from here. Bayern will be in the semifinals by the end of business Wednesday. There is an overwhelming likelihood David Moyes will have the Red Devils again playing the sort of ‘park the bus’ defense while lurking for a counterattack opportunity that earned a home draw last Tuesday. It’s an approach the likes of which were known to the Sir Alex Ferguson-era United only because that’s how the vast majority of their opposition would approach having to face them, rather than something the coaching legend ever considered using himself. Then again, it was a rare situation for Ferguson’s sides to ever enter a match-up as an underdog, much less facing a side overwhelmingly favored to dispatch Man U with relative ease. Hence, where Ferguson might have lost his mind at his team for suffering a home draw with an away goal conceded heading to the away match, the result was widely considered a success for Moyes. Now, the highly scrutinized manager is hoping to repeat last week’s efforts and get a much better result, perhaps with the ghosts of recent failures at home against English competition giving his nothing-to-lose underdogs something better than a puncher’s chance. But it’s not just the psychology of Arsenal, Chelsea, and Manchester City downing the Bavarians on their own turf over the last two years that raise the intrigue of Wednesday’s battle. Bayern have not won any of their three matches since clinching the earliest Bundesliga title in history. A draw with mid-table 1899 Hoffenheim was followed by the draw in Manchester and then this past weekend’s 1:0 loss to FC Augsburg, to end dreams of the Bundesliga’s first-ever unbeaten season as well as a 53-match unbeaten streak. Additionally, Bayern are continuing to have to juggle personnel. Bastian Schweinsteiger is suspended for the match due to his sending-off after a challenge on Wayne Rooney last week. That Javi Martinez will also watch from the stands due to an accumulation of yellow cards leaves Pep without his two favored defensive midfielders. Captain and right back Philipp Lahm played plenty of defensive midfield while Schweinsteiger was injured earlier in the season, which turns out to be a fortunate option for the Bavarians. Central defender Dante also returns after having missed the first leg with his own suspension. Whomever is on the pitch and in which positions come kickoff, the Bayern boss expects the English opposition to “stay deep, wait for us to lose possession, and then quickly organize a counterattack,” again much like what happened last Tuesday when his side possessed the ball for 70% of the match, but surrendered the first goal of the match off a corner kick. Pep says his side is ready for both Man U’s approach as well as the set pieces that nearly cost them much more dearly.